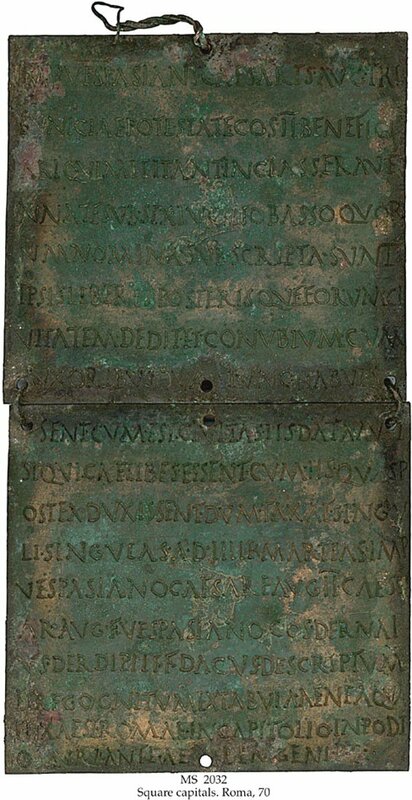 Description	 MS in Latin on bronze, Roma, 26 February 70, 2 tabellas (complete), 14,8x13,4 cm, single column, 8+10+18+10 lines in Latin capitals, 2 holes through each tablet with the wire that binds the two tablets together, originally secured with the seals of the 7 witnesses, 2 holes with complete hinge wires. Binding	 Barking, Essex, 1995, red cloth gilt folding case, by Aquarius. . There are 3 praetorian diplomas (MSS 1801, 1870, 2051/7) in The Schøyen Collection, further 11 auxiliary diplomas (MSS 1836, 1899, 2051/1-6, 2051/8, 2052, 2086), and 3 fleet diplomas (MSS 698, 1921, 2032). Provenance	 1. Dernaius Derdipili f. Dacus, Thrace (70 until his death); 2. Bernard Quaritch Ltd., London. 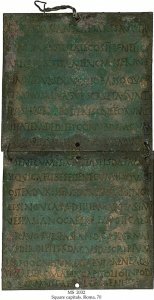 The present diploma gives Dernaius Derdipili f. Dacus an honourable discharge from the navy of Emperor Vespasian, Roman citizenship for himself and his descendants, and the right of legal marriage. The naming of Sextus Lucilius Bassus as commander of the Ravenna fleet places the diploma in an historical context, and casts an interesting light on Vespasian's political skills; as described in Tacitus Histories, II, 100,6; III, 12,2-8; III, 50; IV, 3,1-2; and Josephus Bell. Iud. VII, 6,1(163); VII, 8,1(252). This MS is the first diploma issued by Vespasian. It is also one of the very few diplomas with the original string and hinge wires preserved. The present MS contains the unusual information, of both year, place and the exemplar copied. Published	 Margaret M. Roxan & Paul Holder: Roman Military Diplomas, IV. Institute of Classical studies. London, 2003. no 203, pp. 392-393. Exhibited	 1. "Preservation for access: Originals and copies". On the occasion of the 1st International Memory of the World Conference, organized by the Norwegian Commission for UNESCO and the National Library of Norway, at the Astrup Fearnley Museum of Modern Art, Oslo, 3 June - 14 July 1996; 2. Kistefos-museet, Jevnaker: Romerske portretter i gull og marmor, 22 mai - 25 september 2005.